Duke Hale, CEO of Zoyte USA, meets with new and prospective dealers on Saturday at the 2019 NADA Show. He promised Zoyte will be a disruptor on the consumer and dealer side of automotive retailing when U.S. sales start in late 2020. 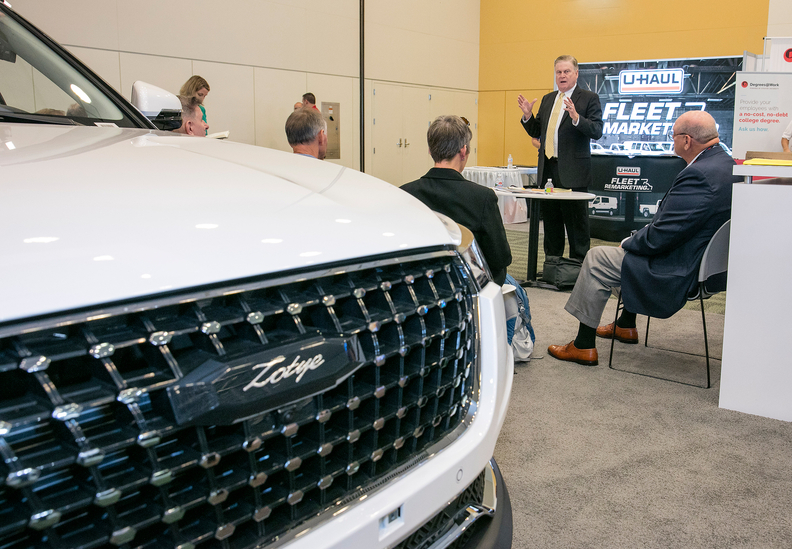 Zotye USA named its first U.S. franchised dealers Saturday at the NADA Show, a group that plans 19 stores and could be among the first U.S. dealers to sell Chinese vehicles under a Chinese automaker brand name. Among the group that has signed agreements to sell vehicles from Zotye (pronounced ZOH'-tay) Automobile International Co. are veteran dealers from numerous brands and states. Irv Stein, a Volvo dealer, along with Jack Stein, Ben Stein and Noah Sullum, plans two stores in Berwyn, Pa., and Doylestown, Pa.
Jeff Stoops, a Buick-GMC dealer, plans a store in Indianapolis. Randy Stoops, a Buick-GMC dealer, plans one store in Muncie, Ind. Roger Scholfield, a Honda dealer, plans one dealership in Wichita, Kan.
Mary Margaret Latham, a dealer with Volvo, Subaru and Hyundai stores, plans one Zotye store in Wilmington, N.C.
Larry Battison, a Honda dealer, will open two stores in Oklahoma City. George Doetsch, a Ford-Lincoln dealer, plans three stores in the Howard County, Md., Baltimore and Washington area; Elkton, Md. ; and the Annapolis, Glen Burnie and Dundalk, Md., area. Ron Fornaca, a Subaru dealer, plans one store in San Diego. Sam Brnovich, a former Hyundai Motor America executive and CEO of BWI Auto Ventures, plans six stores in Sarasota/Venice, Fla.; Port Charlotte/Fort Myers, Fla.; Las Vegas; Los Angeles/Chino Hills, Calif.; and Bakersfield, Calif.
George Whitlow, a Lexus dealer, will open a store in Richmond, Va.
Zotye USA was created in October after parent company HAAH Automotive Holdings of Lake Forest, Calif., signed a distributorship agreement with Zotye. The company plans to enter 80 top U.S. markets, with 300 to 325 sales points and sales of a Chinese-made crossover by the end of 2020. While Zotye officials won't say what that vehicle will be, there are hints it is the T600 crossover, which has been sold in China since 2013. Guangzhou Automobile Group also is meeting with prospective dealers at NADA, for the second year in a row. The Chinese automaker pushed back its targeted launch in the U.S. until the first half of 2020, in part because of the U.S. government's trade war with China. Duke Hale, CEO of HAAH and Zotye USA, called the company's first U.S. dealers powerful with the brands they represent and their accomplishments. Whitlow, who was among the first 24 Lexus dealers in the country and runs a single point today, said he is looking to add to his portfolio on the opposite end of the market. "Zotye seems to be a very good fit for that, again focused on the customer, a high-quality product, clean sheet of paper going for a no-haggle experience for the customer," he said. Whitlow said he plans to use empty space at his Lexus store to operate Zotye. Battison, a Honda dealer with a small stake in a Chevrolet store and who sold General Motors and Fiat Chrysler Automobiles stores in 2012, said he is attracted by Zotye's product and how it plans to serve customers. "The car-buying process in the United States is broken, and we need to fix it," Battison said. "We need to be 100 percent transparent with our customers." Hale, a former Volvo, Mazda and Jaguar Land Rover executive, said Zotye's vehicles could be priced about 20 percent lower than rival vehicles. Consumers also will be able to shop and buy online through a no-haggle pricing environment. "We're going to change the experience for the customer, and we're going to do it through dealers," said Hale, who is drawing on his industry contacts to launch the Zotye brand in the U.S. Dealers also won't be required to spend big dollars on facility requirements. He said the company could disclose the next round of U.S. dealers by the end of March. "We've got the team; we've got the lineup; we've got the price; we've got the value," Hale said. "And we're going to have the experience. It's going to be hard to duplicate. ... A lot of competitors are going to nearly hate us."